The term, Patent Watch services refer to a process of watching/monitoring/checking the patents at regular intervals of time period in official journals, databases, etc. to search for newly published granted or pending patent applications that matches with the requirements specified at the beginning of the watch for our patent, and then subsequentially provide alerts. 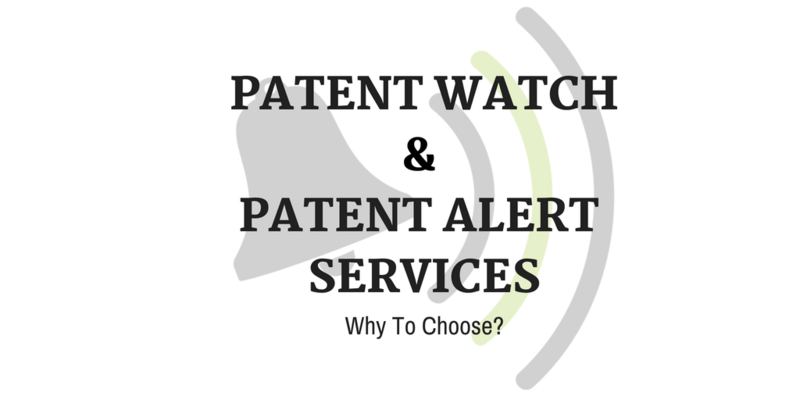 Patent Watch Services & Patent Alert Services: Why To Choose? Overall, Patent Watch Services bring cognizance about the market tactics, competitor’s potential resources, and determines the strength of our services or products. The patent watch & alert services can be classified into two major categories, namely Technology-based and Competitor-based watch services. Further, the watch services can be modified according to your requirements. Let’s understand these two services in detail, in the following section. As the name suggests, Technology-based Watch Services are only confined to provide search results for watching and providing alerts, based on the latest development in the specified technology which can unleash the business opportunities. This Technology-based Watch Service enable our clients to monitor and track the recently issued patents, published patent applications, new inventions in the field of interest within a specified period, such as weekly, monthly, quarterly. Followed by the watch services, the alert service makes sure that the client gets the updated report and becomes alert about the legal status and patent progress on the prosecution state of the published patent applications in the field of interest. Similar to technology-based watch service, a Competitor-based Watch Service assist clients to monitor and alert the recently issued patents and or published patent applications regarding his/her competitors. This watch service will facilitate watch entirely focused on identifying the status and progress of the competitors work from the recent patent activities from his side. The basic motto of inculcating competitor-based patent watch service is to find the abandoned, expired, or rejected patents of competitors, that can be further taken into use without infringing any patent or without inviting any legal risks. The Patent Search Firm is a part of ‘Sagacious IP’ which is a global player offering comprehensive IP solutions. We hold an experience of more than eight years in the IP industry, successfully performing 100+ full-time search and 500+ patentability search in a month. We provide patent watch services based on Technology (through keyword/IPC) or Competitor (through assignee/ inventor name) with a bucket-full of add-ons to it, depending upon the client’s requirement. We also provide patent watch services based on Patent/Publication number, according to different time frequencies, such as Fortnightly, Monthly, Quarterly, Annually, and Semi-annually. To know more about our services, visit our service page. This entry was posted in Blog and tagged Competitor-based Watch Services, conduct patent watch, Freedom to Operate Search, Invalidity Search, IP industry, IP solutions, patent applications, Patent Monitoring, patent watch services, patent watching services, prior art searching, state-of-the-art searching, technical intelligence, Technology-based Watch Services, Types of Patent Watch. Bookmark the permalink.